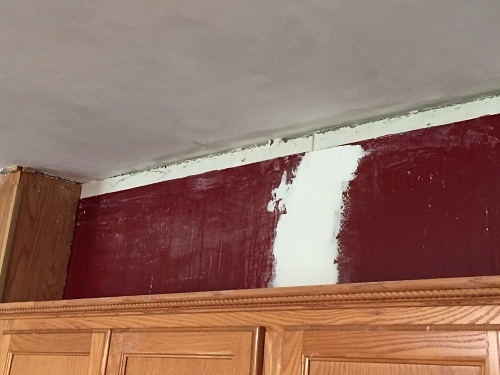 Runs for Cookies: Another Kitchen Renovation Update: Paint Colors! I wish I had huge updates that were very visible in photos, but it actually doesn't look a whole lot different! Mudding and sanding the seams has taken forever. I had to do three coats of mud, and wait 24 hours between each coat. 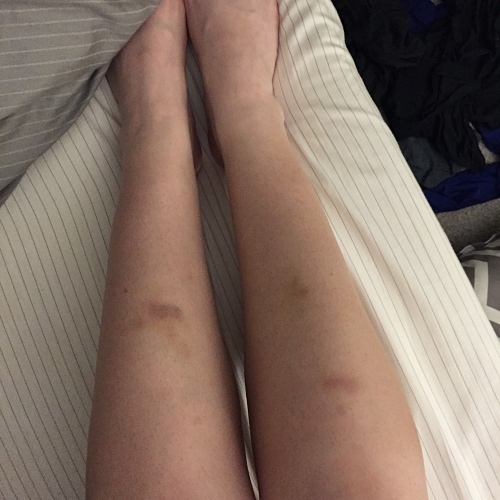 First, let's look at my bruises battle wounds. My shins have every shade of bruise in various healing stages, hahaha. This is from standing on the ladder and bracing myself against it--my shins are perfectly centered on the rung above my feet. 9) Tape, mud, and sand the joint between the ceiling and walls. THREE TIMES. After I removed it, I was horrified and almost put it back up. But after some research online, I decided to try and tape/mud the joints myself. I figured if it looked terrible afterward, I could always just put some trim up to hide it. And here is what it looks like after taping/mudding/sanding the seams. I did this to the entire kitchen, dining room, and living room. THAT is why I've been too busy to write! Yesterday, we FINALLY got to start priming! 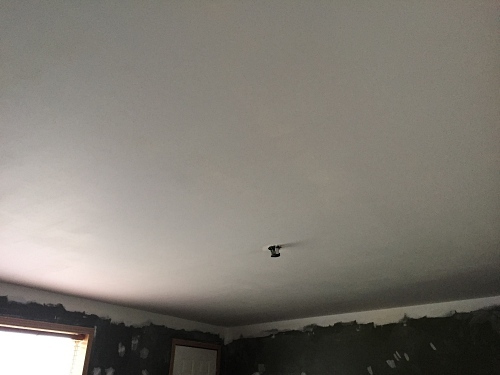 We dusted/cleaned the ceilings and then put on one coat of primer. 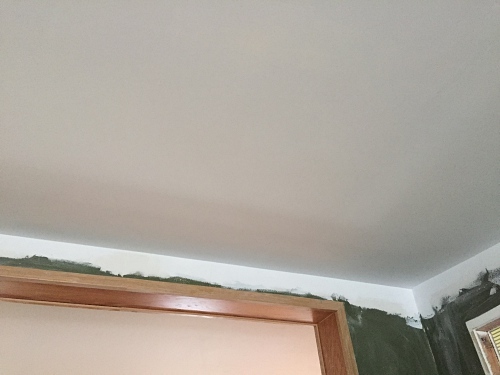 The photo above shows the ceiling after the primer. I think it looks awesome, and we haven't even painted it yet! On Saturday, I got an email about Sherwin Williams having a 40% off sale on their paint. I couldn't pass that up (when did paint get so expensive?!) so Jerry and I went over our color choices one more time and decided to go get the paint. I was actually really nervous about it. The cabinets, mostly--I had been planning all along to paint them white. 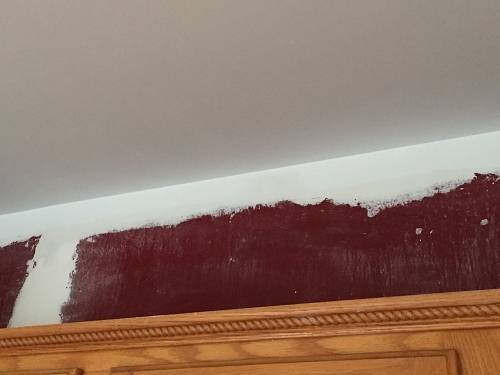 But I really didn't want my kitchen to be plain looking (I clearly love color!) and I went with a color that I never in a million years would have thought I'd pick: blue. Very, very light blue--but still blue. I'm not a fan of blue in any shade, but for some reason, I was really drawn to a light blue/bright orange combo. I love gray, but I didn't want the sterile look of gray and white (my house is very much not "sterile"!) --adding the blue and orange is very much "me". I love your choice of colors! We rent and can't paint our walls, so I live vicariously through others' decorating. I think the gray and orange and blue will be lovely. We have CityScape in our living room and we love it! I can't wait to see how it will look when its done....I like the colors you've picked. Love the colors- especially the orange!! WOW! It looks great! That's a ton of work and clearly it's paying off! Great job! Like you--I LOVE color in my house. Lots and lots of color. When we moved here in 1992, I wallpapered many of the rooms, a choice I loved at the time but have come to regret. Wallpaper is no longer IN, and I am much too old and tired (and broke) to try to remove it all or hire it done. 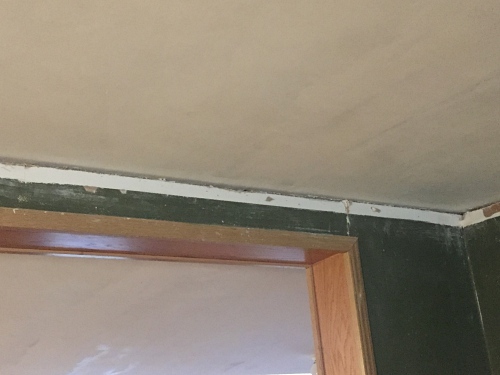 We removed some of the original wallpaper and after realizing what a chore it was (my elbows literally burned for several days afterwards), we hired the rest of it done. 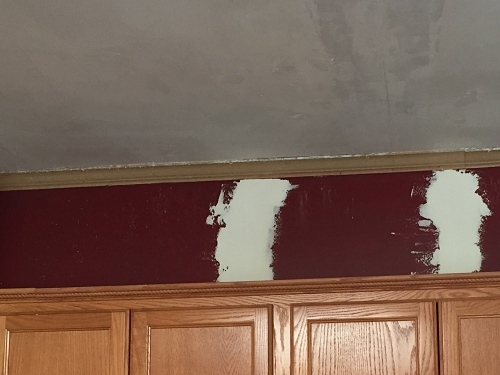 So now we're stuck with outdated wallpaper in a house we really need to get ready to sell so we can downsize, but are in no hurry to do, so we continue to procrastinate. I cannot wait to see the finished project. 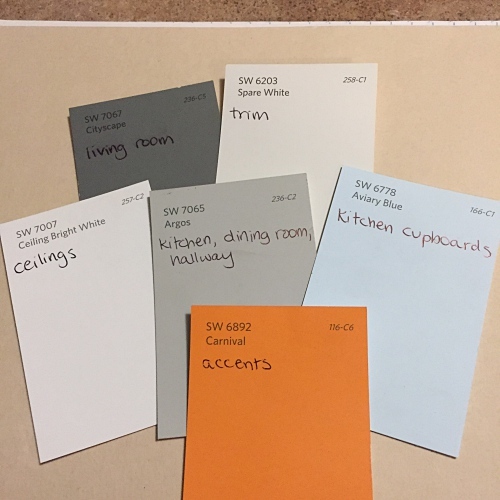 Your idea of painting the cupboards light blue with orange accents is so intriguing. Good luck on this HUGE project, I know it's gonna be beautiful when you're done. You've been hard at work! Can't wait to see the final outcome!!! FYI, we did our bedroom a dark gray and it made it look so dreary and mopey...it's so depressing!! But we also have dark furniture..What a dumb decision. I' sure it would look fine if you have lots of natural light coming in (which we don't) and light accent pieces/ furniture. Wow, you did those seams perfectly! I honestly would have thought a professional did them. Loving the colors! I would have never thoughtorange, light blue and grey would go so well together but when you put the swatches against each other I absolutely love it! Can't wait to see the finished product! !